Meeting comes as government seeks to outlaw Muslim Brotherhood, following weeks of bloodshed. Egypt’s cabinet is set to hold a crisis meeting on Sunday regarding the current violence engulfing the country. The interim government has apparently decided to legally dissolve the Muslim Brotherhood in a bid to end the decades-long power struggle between the state and the Islamist group. Interim Prime Minister Hazem el-Beblawi had assigned the Ministry of Social Solidarity to study the legal possibilities of dissolving the group. The Muslim Brotherhood, whose members are key supporters of former President Mohamed Morsi, came to power in the country’s first democratic elections after the fall of former President Hosni Mubarak in 2011. Demonstrations are planned to continue around Cairo today, forcing the Egyptian administration to act fast during this state of emergency. Overnight in Alexandria, Helwan and Minya, protesters marched in the streets showing their defiance for curfew restrictions. On Saturday, security forces broke into the Al-Fatah mosque in central Cairo, where hundreds of Muslim Brotherhood supporters had holed up. The forceful entry had been preceded by heavy exchanges of gunfire. The interior ministry said yesterday that 1,004 Muslim Brotherhood members had been detained in raids across the country, with bombs, weapons and ammunition seized. The Brotherhood was quoted as saying sons and daughters of leadership figures had been targeted in an attempt to gain leverage over the organization. The Egyptian interim government has said they are engaged in a battle against the forces of "terrorism." 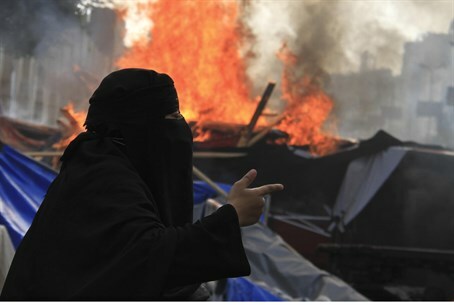 The Brotherhood has called for daily demonstrations since a crackdown on its protest camps in Cairo on Wednesday left hundreds of people dead. At least 173 people were killed over the weekend in Egypt in heavy fighting.